BOTTOM LINE: Gelsey Kirkland's version of this classic children's story showcases the great training at her academy and its serious intent on quality dancing. The party scene passes by with a rambunctious boy’s dance, girls prancing about, and a predictably soothing parent and grandparent’s dance. There is a group of adults miming playing the Tchaikovsky score for us which is very literal, but sweet. A highlight is the Columbine and Harlequin dance with Anderson Souza and Nina Yoshida who really seem as if they are dolls. A flamboyant Drosselmeyer, played by Johnny Almeida hands his niece Marie a nutcracker and then feisty Fritz ends up breaking it. Morin as Marie portrays this coming of age ballet sensitively and earnestly and as she dreams of her Nutcracker prince, he appears just in time to save her from some giant mice who try and attack her. The people from the land of sweets appear and bring forth the cavalry from a larger-than-life cabinet. They exit the box from a slide and triumphantly overtake the mice and rat king. The smallest, young Charles Klepner, who is the Bugle Boy and object of ransom in the battle steals every scene he is in as dancer and comedic relief as the mice and soldiers fight to save him. The Nutcracker Prince prevails and snowflakes begin to fall. The snow scene begins with ecstatic seamless partnering by Morin and her Prince, Marko Micov. There was no traditional Snow King or Queen, just the two lovers meeting and making their way to the Nutcracker Prince’s kingdom. The Spanish dancers have flair. Souza and Galen Bolard as the Russians kick the second act up a notch with their charisma. The Flutes, a section choreographed by Kirkland herself, is full of fancy footwork and shows the three women hitting high notes with technically challenging hops and short solos. The Chinese dancers and corp are enthusiastic and spritely. My only disappointment is the repetitive choreography of the Waltz of the Flowers. Habuchi stands out in the Waltz of the Flowers and draws attention to his clean lines and presence even in stillness. Kirkland and Chernov make sure that logic is a part of every piece of this ballet. They also replace the Sugar Plum Fairy and Cavalier with a effervescent duet with Marie and her Prince. The purity of both Morin and Micov shows in their suspended jumps and brisk turns. Their dramatics make it seem as if they really are in love. They have chemistry and the technique to make us feel with our hearts, and not just our eyes. 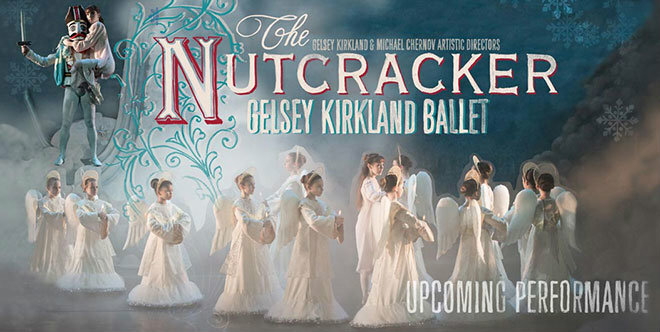 The Gelsey Kirkland Ballet’s production is full of drama and is pushing forward each of their artists in their solo moments. The lavish costumes and sets adopted from the New York Opera push this production value up infinitely. This magical production makes you wish you could see the world from Morin’s starry eyes.